I'm sorry it's taken so long to host another giveaway but I promise this one was worth the wait! I've teamed up with two of my favorite brands, Trashy Diva and Chelsea Crew, to offer the chance to win a new outfit... Literally from head to toe! The seasons are changing and Trashy Diva's Ribbed Rayon is the perfect collection for the transition. And much like the endless outfits I feature here, Chelsea Crew shoes give your ensembles that classic finishing touch. To get all the details on the giveaway and learn how to enter, keep reading below! The Candice Gwinn Grace Coat Dress is pretty self-explanatory: you can wear it as a light coat or you can wear it as a dress. Considering how mild our seasons are here, I've chosen to wear it as a dress. The Grace features a tailored bodice with princess seams, three-quarter sleeves, a knee-length pleated skirt, and a Peter Pan collar with covered buttons down the front. 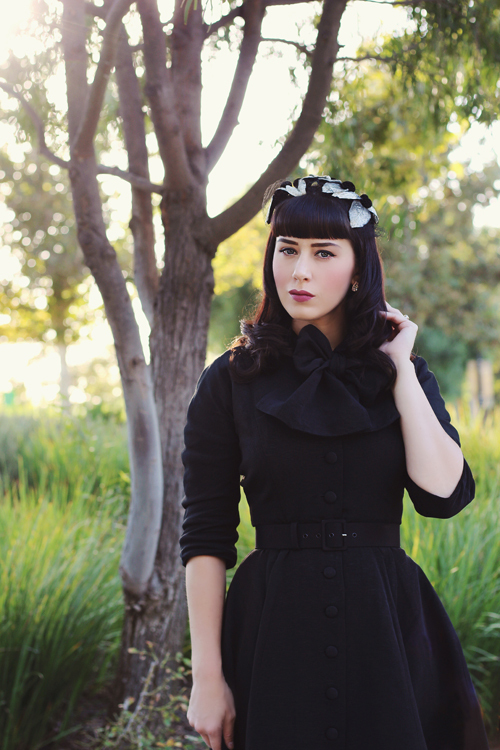 There's also a removable sash that you can wear as a bow around your neck (as I've styled here). This particular style runs quite small and while I hover between a 2-4, I chose a size 6. If you're planning on wearing it as a coat like I am, it's best to size up. I've paired the Grace with the Chelsea Crew Lonny velvet heels in black. I've featured them on my blog several times and I also own them in red. They're such a great staple and I feel like I need another pair just in case! This giveaway will be run through a Rafflecopter widget, which you can see below. There are eleven ways to enter and none of them are mandatory (no pressure!). But as I'm sure you already know, the more ways you enter, the better chance you have of winning! The giveaway winner will get an item of their choice from Trashy Diva's Ribbed Rayon collection and their pick of any Chelsea Crew shoe. Of course, your picks will be honored as long as they're in stock in your size. This giveaway will run until the end of the day on Friday, October 13th (11:59pm to be exact). I'll contact the winner over the weekend and the official winning announcement will be on Tuesday, October 17th. Have any questions about the giveaway? Feel free to comment below! Thank you so much for entering and good luck!